Indian Railways plans to trial run high speed trains from Spanish firm Talgo, after successfully launching Gatimaan express. The Spanish train maker has offered to test run its faster and lighter trains free of cost on the existing Indian Railways network. Indian Railways is planning to test run the high speed train manufactured by Spanish firm Talgo with a maximum speed running upto 200 kmph. This trial run is planned in June 2016 on the existing tracks. Maintenance works had been done on the tracks between Agra and Nizamuddin station before the launch of Gatiman, the fastest train in the country. Nine Talgo coaches have been dispatched in a cargo ship from Barcelona and are expected to reach the Mumbai port in the end of April 2016. The Spanish train maker has planned to test run the train free of cost on the existing Indian Railways rail network. The train will be kept at Izzatnagar depot for trial run planned in June. The Railways Minister has announced that the first Talgo train trial will be conducted between Bareilly and Moradabad at a maximum speed of 180 kmph. This will be followed by the second trial between Palwal and Mathura at a maximum speed of 180 kmph. The third test is planned between Delhi and Mumbai at a maximum speed of 200 kmph. The Talgo train can run at varying speed between 160-200 kmph on the current infrastructure. But some minor changes need to be done on the tracks for Talgo trial run. The cost of importing the coaches is borne by Talgo. Besides reducing the travel time, the Talgo lightweight trains consume 30 percent less energy than normal trains which would help to reduce the power bills in the long run. Depending on the result of the trial run, Railways will consider introduction of high speed trains on other routes as well. 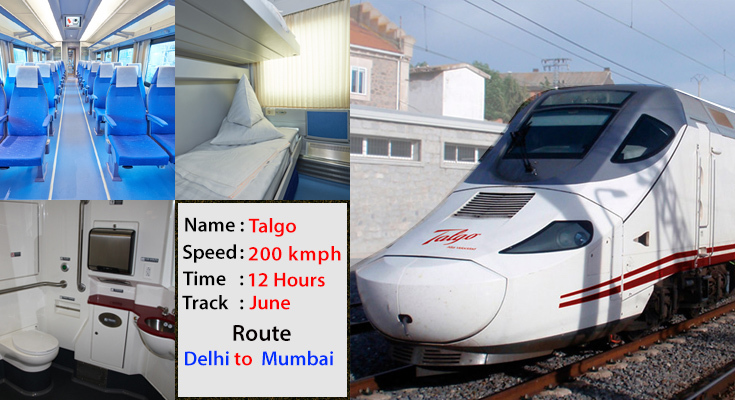 Talgo will conduct the trial run on the Delhi Mumbai corridor. As Indian Railways is moving ahead with the Diamond Quadrilateral project, it has selected companies from China, France and Spain to carry out the feasibility study of the routes connecting Delhi with Mumbai and Kolkata. The Diamond Quadrilateral project costing two lakh crore together with the bullet trains will reduce the passenger travel time to half between Delhi and other metros. Thus we see that Indian Railways has ambitious plans of increasing the semi high speed and high speed trains along the vast and long railway network of the country, for the convenience of the passengers. Child Fare Rule Revised From April 2016 - Full Fares For Children From 5 To 12 Years. Indian Railways Introduces Tri-Weekly Superfast Suheldev Express Between Ghazipur And Anand Vihar. 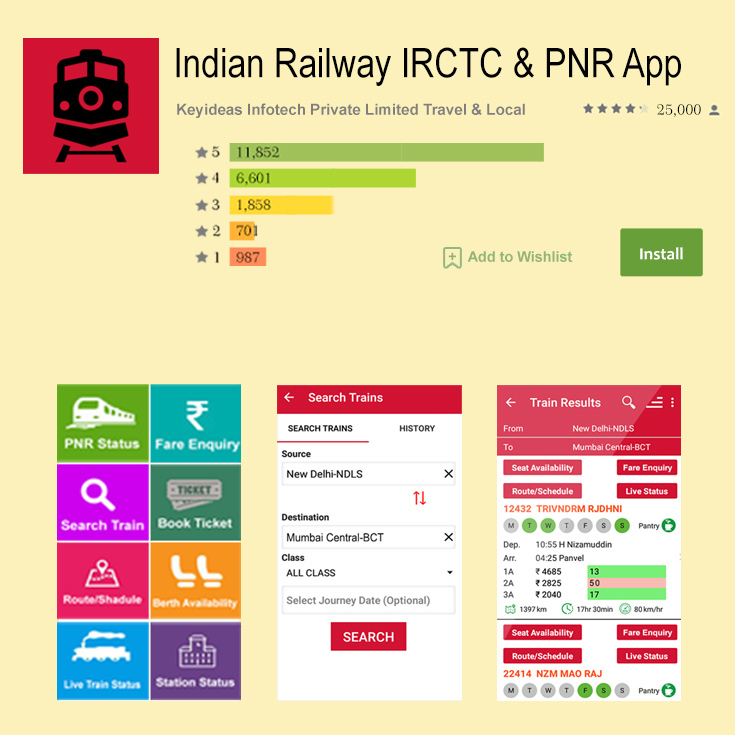 IRCTC Makes Special Arrangements for Chaitra Navratri. IRCTC To Offer 25 Varieties Of Customizable Tea On Trains. To Ease Pressure, Indian Railways Introduces Staggered Tatkal Booking Timings.